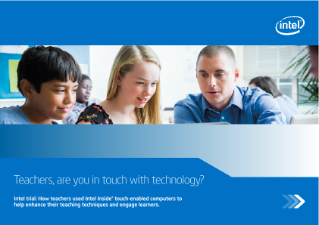 Teachers, Are You in Touch with Technology? It is no exaggeration to say that mobile computing is everywhere—at home, in the office, in coffee shops up and down the high street. And, of course, in schools and colleges. Technology is an essential part of everyday life for the vast majority of the UK’s students. So much so, that a laptop PC or tablet has now taken its place alongside ...the pen and paper in a student’s educational toolkit. And powerful tools they are, too. Mobile computers help students to research material relevant to their studies, write essays, and complete coursework, all of which provides valuable experience, helping them to succeed in an increasingly technology-driven world. For teachers, the benefits of mobile computing are equally compelling. It helps them to plan lessons, keep up with marking, and work on and store reports, giving them more time to spend with students. But the benefits of mobile computers in a learning environment are multiplied considerably when all students and teachers within a school or college are equipped with compatible devices. It enables students to interact with each other and their teachers, collaborate on projects, upload comments and homework, and receive feedback from teachers and peers. Teachers can post lesson plans, homework, coursework tasks and resources for their students to access. They can employ a variety of apps to make teaching more interactive, more engaging, and more rewarding, and share those resources with colleagues. Read the full Teachers, Are You in Touch with Technology? Case Study.